My Crafting Channel: Silly Girl 9" Doll "Daughter of Chucky"
Silly Girl 9" Doll "Daughter of Chucky"
Good morning everyone. I think spring is finally here. Thunderstorms everyday. At least we are having some warm weather. I wanted to make of these Silly Dolls. Since we are hosting a Make a Doll Challenge over at 2 Creative Chicks. You can see my Bunny Glove Doll Here. 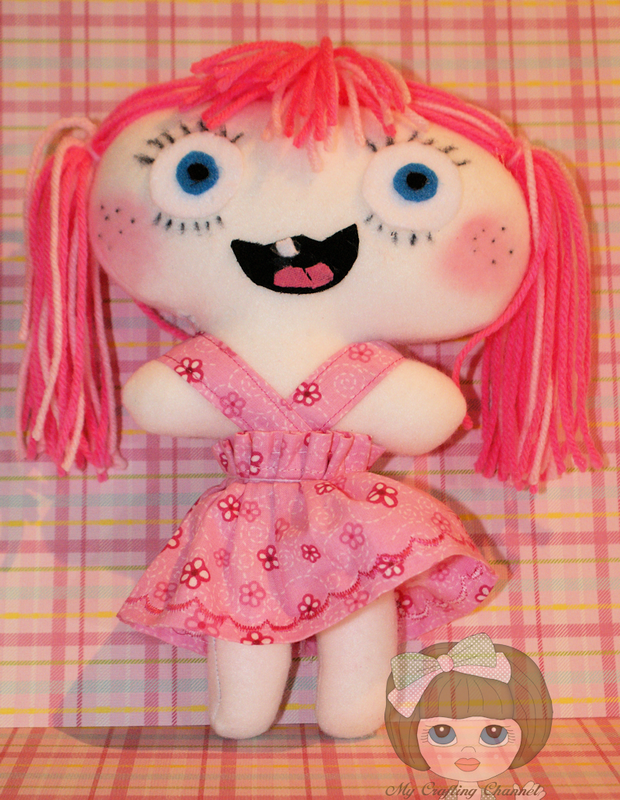 The doll body is a free pattern called Silly Girl. The eyes, hair etc is up for one's imagination. The pattern does come with eyes you can use them or not. You can cut out the face, embroidery face. Again it is up to you. Here is a Link to see dolls made using this pattern by others. I have not made a doll since Barbi was 1 year old and she is now 34. This really pretty easy. The instructions said to use Muslin, I used fleece. Was supposed to use felt for eyes and embroidery the other face features. I did use felt for the eyes, I used fabric glue instead of sewing them on. I could not find my container of floss so I drew the lashes with a sharpie. The mouth I decided to really make it silly and use a mouth from a baby file from the Silhouette Store which I cut out and glues on. I love the little tooth. I decided to mix 2 colors of pink for the hair. The dress was a fat quarter. Which was cut and hemmed on both side. Did a decorative stitch to the bottom. Sewed send together and then ran a gathering stitch for the waste line. Made straps from the same fabric. I sure think she looks silly. What say you? Sam said she need some cheeks and freckles. So here is a new pic. Hop on over and check out the challenge and enter a doll today! What a cutie!!! I love her little dress!!! Hugs!!! It amazes me that you can do stuff like this. I love it! How adorable! Love those freckles,big smile, pink cheeks and hair, and of course her darling dress! Great job! This doll is adorable!!! I love her dress and the pink hair!!! I love your lovely doll, Nana!!! Have a great day. Oh my gosh, she is so cute Nana! I love her sweet flowered dress and darling long hair! So cute! OMG!! This is seriously WAY TOO cute!! I cannot stop laughing...Chucky's daughter?...LOL....Too funny!! Love it!! Adorable!! super cute details on adding freckles...love it!! You doll is so cute and adorable. I love how you can make these doll look so different. Have a great day! How fun is this little cutie?! What a great face, she is just too cute. I love the addition of the freckles, great touch!